Habitat: Dry forests. Lithophytic or epiphytic in dry forests. Description: It is a slender, much-branched at base, creeping or epiphytic cactus cultivated as a houseplant for nearly 300 years. 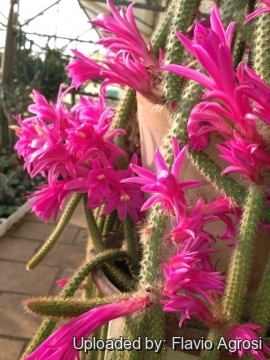 It one of the most popular of cacti for its ubiquity in modern collections and home use. The 'Rat's Tail' is also very free-flowering, and its long, slender stems bear multitudes of crimson-pink blooms and makes a good hanging plant. A larger specimen can be quite impressive, tumbling out of a pot, suggesting a waterfall. It is said that it deserves first place among the Cacti of easy culture. Stem: Slender, vine-like, weak, ascending at first, soon prostrate or pendulous (or climbing), fresh-green later grey-green, terete, up to 1,5(-2) m (or even more) long, round in cross-section about 1-2 cm in diameter. Areoles: Minute, whitish, close set 4-8 mm apart. Spines: 9-14(-20), tiny, acicular, bristle-like, reddish brown or reddish yellow, 4-5(-10) mm long. Blooming season: It flowers in mid and late spring and blooms for several days. Fruit: Globose, 10-12 mm long, 10 mm in diameter, red bristly, pulp yellowish. Remarks: This species, too, has cristate forms. Cultivation and Propagation: This is probably the easiest species to cultivate and relatively fast growing. 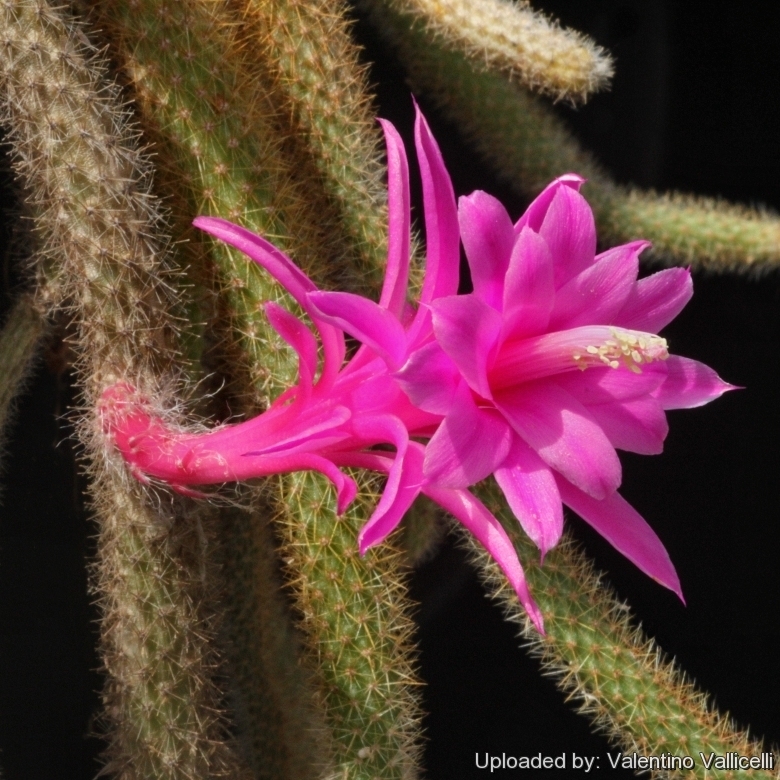 A beautiful plant for a hanging basket, this cactus will grow happily in a window. It needs a well drained soil, requires strong sun to part sun. During the growing period the plants need frequent watering; from October to March and waterings should be rather abundant, so that the soil becomes completely soaked, but let dry between watering. Keep relatively dry in winter or when night temperatures remain below 10° C. It is hardy to -4°C for a short period. Assure a good ventilation. Traditional uses: The flowers of this species are extensively used medicinally in Mexico. They are sold under the name "flor del cuerno" in the drug markets, for use as a medicine.